Sonoluminescence is the production of light from sound. This effect, discovered just over ten years ago, has been, and continues to be, the subject of considerable experimental and theoretical research. Sonoluminescence (SL) refers to the phenomena in which a micron size gas bubble is both spatially trapped and oscillated by an acoustic field in such a way that on each compression of the bubble a small burst of light is emitted. This light emission is in the form of extremely short bursts (< 100ps), but is periodic, occuring in phase with each and every cycle of the driving pressure field. Each bubble collapse produces about 500,000 photons. The bubble collapse is so violent that some predicted theoretical accelerations are larger than those associated with a Black Hole! The actual emission mechanism has not yet been explained, although theories are as plentiful as they are diverse. Students begin their exploration by first understanding some basic acoustical principles, such as resonance behavior, quality factors, variation of sound speed with temperature, and the eigenmode structure of a 3-dimensional resonance "cavity." Once these principles are understood there are a large number of experiments that can be performed focusing on the liquid sample preparation and the light emitted from the bubble. 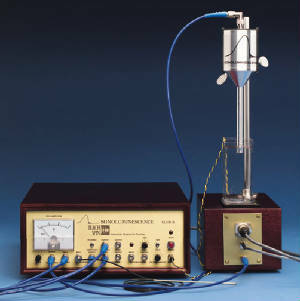 The basic apparatus, shown to the right, consists of a rectangular cell that houses the water with a high frequency piezo microphone, an ultrasonic horn that is used to deliver acoustical energy to the system, and a control box that contains an integrated amplifier and resonance detection circuitry. The control box also contains active components that can filter and rectify the signals from either the cell's transducer or from the separate high frequency hydrophone probe. Among the other features in the control box are two separate adjustable power supplies, one for an optional temperature controlled cell and another for an optional photomultiplier, as well as a peak detector for the photomultiplier unit.